Skogskyrkogården Woodland Chapel, Stockholm (1919) Architect: Gunnar Asplund, from the Swedish Centre for Architecture and Design’s collections. Stanley Picker Gallery has helped students from Kingston University School of Architecture & Landscape to find the ideal wooded site, in the grounds of nearby St John’s Primary School, for the construction of a shelter forming part of their current investigations into Skogskyrkogården, the Woodland Cemetery and UNESCO World Heritage Site in Stockholm, Sweden. Taking direct inspiration from Skogskyrkogården Woodland Chapel designed by Gunnar Asplund in 1918-20, the students, led by contemporary architect and lecturer Takeshi Hayatsu, will construct their temporary shelter with the direct involvement of the local school’s children and staff; the project’s delivery forming part of the Stanley Picker Gallery’s wider Participation Programme. 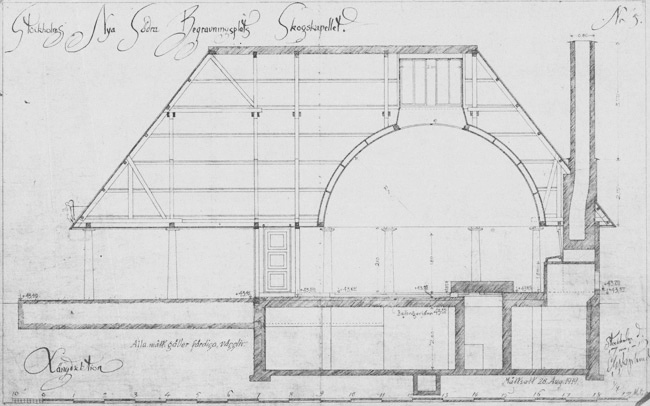 Asplund’s design for the original chapel (above) was reduced to a more modest scale and construction due to financial restrictions of the time. 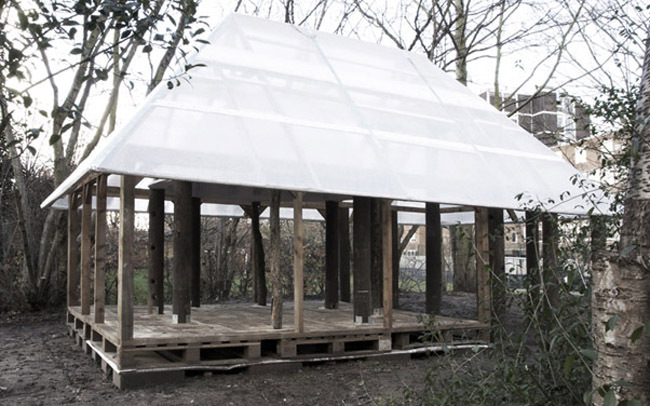 The students will continue this approach, using recycled and sustainably resourced timber to make their own scaled-down version of the structure. The project will also employ paper as a primary material, with the interior dome of the shelter made from papier-mâché. A workshop will be held to learn this specialist craft from Sarah Mayfield (England Ornamental Plastering) an expert on the papier-mâché technique. With all the component parts prepared in advance, construction will take just ten days in January 2014, the structure then remaining in place for the school children’s continued enjoyment.